One card, lots of local businesses! 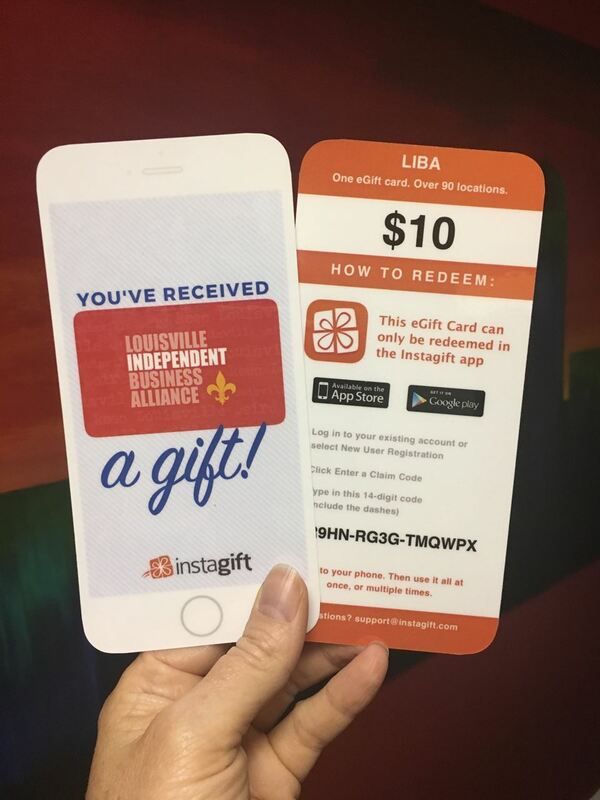 Click here for instantly available eGift Cards and a list of the many LIBA member retailers, restaurants and others who accept it. You can redeem them from your mobile phone, or send them as gifts (via email or with a special card). They look great, make fantastic gifts and never expire! Option 1: Save it to your account, then print your gift anytime (see example here). Option 2: Schedule an email to the recipient for a specific date. Option 3: Email it to gift recipient right away. Option 4: Order plastic cards that include instructions for your recipient to redeem through the app (see example of front and back here). We will mail them to you and you can use as you like! $10 or $25 available. Email us for other denominations. You can also feel good that the purchases made are keeping more money in our community, and keeping Louisville weird! To access gift certificates from your mobile device, download the Instagift app for iPhones here, or for Androids here. Questions? Send an email to support@instagift.com. They’ll respond right away!